A copy would look great on my digital coffee table. Would love to get a copy of the book! Thanks for the opportunity. I’d be glad to have the book! Me wants one sooooooo bad ! Thanks for the opporunity ! Yes I want it , too!!! Hi. One would be nice. Any problem in sending it to Spain? Yes, this would be good for me. Being colour blind I need as much design inspiration and guidance I can get. This is niceeee! :) Yes pretty please. Great! Dream about that book! It just a nice book.Thank you. I always try to leave comments on this, but never win :( Well, let’s hope this time will be different as I really would like to get my hand on Awards Book. This is definitely something that I would like to gain and use to become better at what I do. I also hope that Mykolas Paslaptys finally wins too. Oh, nice site redesign! Would love a copy of this book. That would be a splendid addition to my small little designer’s library!!! ¡¡¡ I would really love to have this book in my shelf !!! I promise to read every single page of the book ! :D Even the blank page. #Kidding. Awesome book. Might just be every web designer’s bible for inspiration. 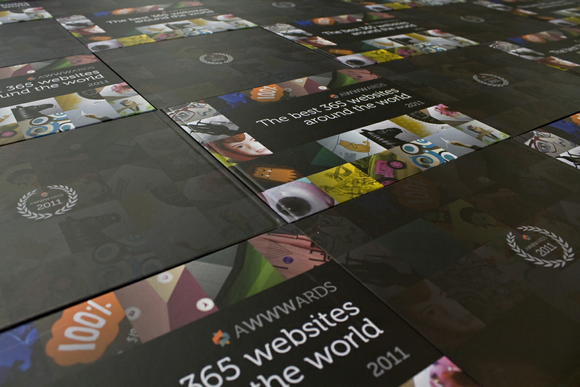 Hate to say I’ve never heard of the Awwwards but this book looks awesome! Would be awesome to see the winning submissions! Definitely best creativity needs inspiration. I love to win this copy to inspire me to bring out best of mine. This is best giveaway after the new look of webappers. Wow, looks like a nice book! Who knows I may actually win one!! A well designed website a day keeps the doctor away. And with 365 sites that would keep a soul like me healthy, all year long :) I would love to be inspired by BEST out there. I hadn’t previously heard of this book – looks really nice! I love being inspired by truly great design in both print and web. What would be a better way than to have such an excellently produced book. I love this type of books, like dribbble, but available wherever and whenever you want. great! awwwards is a fixed tab on my browser, always looking for the best references, i’d love to be picked!! Awwwards or award, this is s book that i need. I’m interested to see what country is leading the way in design. I want a copy tooo!!!! Awesome giveaway! I have been wanting this book for long! I’m game. I could use this book in my collection. I just started my new position at a design/dev agency in New York, and have brought the incredible world, that is Web Appers, to the minds and Macs of the people I work with. I check this website about 10 times a day and have never been disappointed by it’s stature to provide exactly what Im looking for. We are in the process of moving to a new office where I will begin to build my already abundant ‘artistic library’ for the agency. I am also a huge fan of Awwwards and rely on their ability to inspire and promote just as much. Its great to see both of your organizations collaborating and adding momentum to the design community. I’d love to add this book to my growing collection. I actually just got surgery on my hand this morning which has, unfortunately, stripped my ability to fully work, at least for the next few weeks. I would really like to spend that lost time at least reading and continuing to build my open source digital library here at Web Appers. Thanks again! omg awwwards is spelled with one w — NOT three! You guys always have the best giveaways! Great guys, I can’t wait to see this book, pick me please! Thank you for this great opportunity to learn from the best and try to be better. A year worth of inspiration? Yes, please! This would definitely be a good resource of inspiration. I hope to win this contest. Thanks for the opportunity. I hope to win one copy :) Good luck to everyone! Cool book. I’d love you win one! Id love to have this book, I visit the site every day for inspiration! Wow! Great book to the win in my birthday. I just got a UX design job at a world leading hosting company, I would so wish to get this book in order to prove I’m up to the task! I’ll post again for this, seems I am not appearing for some reason. I would love one of these books. It’s a great source of inspiration for me because I’m colour blind and it’s an easy way to see sites that work. I am web expert, so if i grab this book i think it will make me an advance expert :) in websites programming!!!! i don’t want the book, i just love to west my time wrting comments. Really, but if by any chance i win the contest, i have a friend who surprisely have the same name as me who wouldn’t mind having it! If only I win it ! Awesome web design book, who doesn’t want it?! Inspiration always comes in handy! Good book, I want it! That would be a nice addition to my bookshelf!!! We are web designers and visit awwwards to get design Ideas . Hope we will win a copy of the book . Loving the new site design! Feels way more appropriate for all the info you source of open-source software! Nice one! So keen, I missed out on the last one so I’m definitely wanting to get a copy of this one. I’ll be more professional just by having it in the office. I would love to get the book.